Malaysia's Prime Minister Najib Razak inspects the United Malays National Organisation (UMNO) youth during the annual assembly at the Putra World Trade Centre in Kuala Lumpur, Malaysia, December 10, 2015. 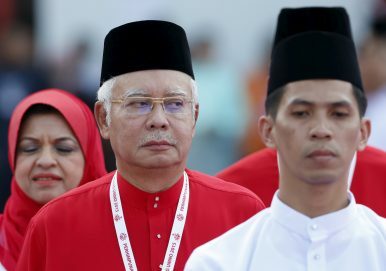 WASHINGTON, D.C. – Predictably, the chatter ahead of Malaysian Prime Minister Najib Razak’s visit to the White House next week has focused either on specific deliverables, like potential defense deals, or thorny issues like a high-profile corruption scandal implicating the premier. While both sides are expected to make some headline-worthy progress in the heavily scrutinized visit, the true test for U.S.-Malaysia relations lies less in the successful conduct of this interaction and more in the ability of both sides to manage the challenges likely to relations further down the line. For all the focus on Najib himself, the reality is that the United States and Malaysia have successfully cooperated on a range of issues under six prime ministers since the Southeast Asian state’s independence despite disagreements on matters such as economic policy, human rights, and U.S. foreign policy in the Middle East (See: “Getting to Full Bloom in US-Malaysia Relations”). And even though bilateral ties had hit new heights under Barack Obama – with both sides elevating ties to the level of a comprehensive partnership and Malaysia becoming a member of key U.S.-led initiatives, be it the Trans-Pacific Partnership (TPP) or the Global Coalition to Counter ISIL – incidents like the 1MDB scandal and issues like human trafficking continued to pose complications for ties (See: “Malaysia in 2015: Crises of Confidence”). The initial forecast for U.S.-Malaysia relations under Trump seemed to be rather gloomy, with Malaysian policymakers, like their regional counterparts, worrying about the implications of a so-called America First foreign policy with the nixing of TPP, the release of a trade hit-list, the questioning of the One China policy, and the Trump travel ban (See: “Trump’s Real ASEAN Test”).Yet as the Trump administration’s Asia policy began to take shape, convergence, as it often does, became clearer in certain areas like North Korea, eventually paving the way for Najib’s White House visit. There is no doubt that the visit itself is a feat within the context of the bilateral relationship. The last time Malaysia was granted a White House visit was in 2004 under former premier Abdullah Badawi, and this is Najib’s first-ever White House visit since coming to power nearly a decade ago. And though the fact that he is just the second Southeast Asian leader to visit the Trump White House (after Vietnamese Prime Minister Nguyen Xuan Phuc) is partly a consequence of scheduling changes, officials from both sides also had to do a lot of substantive work to get the visit through so early on in the Trump presidency and so quickly as well. Both sides also do intend to make some tangible progress in the relationship during the visit. The official agenda itself will be presented as wide-ranging, in line with the 60th anniversary of diplomatic ties as well as the realities of the comprehensive partnership itself. But the top agenda items – which include North Korea, counterterrorism, and maritime security – expected defense deals, the timing of the visit (which coincides with September 11), as well as the nature of some of Najib’s more private engagements, will make the visit seem a bit security-heavy, albeit with the 1MDB scandal looming over it as well. Such progress ought not to be dismissed, particularly at the beginning of a new U.S. administration. But at the same time, it is important to keep in mind that the true test for U.S.-Malaysia relations will lie less in the successful conduct of this interaction and more in the ability of both sides to manage three key challenges likely to relations further down the line. The first of these relates to reliability of the other, both with respect to the relationship as well as in the stance towards regional and global issues. Beyond the hype of a pivot to China, some in Washington have grown concerned about whether Najib’s personal quest for domestic survival, which had already undermined Malaysia’s economy, polarized its politics, and upset its fragile multi-ethnic fabric, is also subsuming the country’s foreign policy and impairing its ability to balance its alignments with major powers, chiefly the United States and China. Though there is a tendency to overstate the degree to which this is occurring, the perception of what I have termed the “Najibization” of Malaysian foreign policy has nonetheless persisted among even some well-informed observers, especially as we have seen the Southeast Asian state make some unprecedented moves in its ties with Beijing in recent years (See: “The Danger of Najibizing Malaysia’s Foreign Policy”). But even Malaysian policymakers who are sympathetic to Washington’s concerns on this score are quick to point out that reliability cuts both ways. Trump’s withdrawal from TPP – an agreement that was especially significant in the context of bilateral ties since the two countries had failed to negotiate a bilateral free trade pact; and one that the Najib government, to its credit, had worked hard to sell despite domestic opposition – was a huge blow to U.S. credibility. And, more broadly, with so much still so uncertain about the Trump administration’s overall Asia policy and foreign policy more generally, including its approach to China, there is little incentive thus far for Malaysia to reconsider its long-held hedging tendencies (Malaysia, it is worth recalling, was the first ASEAN member to normalize ties with China following the Nixon-China shock in 1972) (See: “The Ticking Clock on Trump’s Asia Strategy”). The second is minding the gap with respect to threat perceptions. Framed as a general proposition, it would be difficult to dispute the fact that Malaysia and the United States do have common interests across several issue areas, be it in battling the Islamic State threat or addressing China’s growing assertiveness in the maritime domain. It is also understandable that the Trump administration has begun asking more of individual Southeast Asian states, including Malaysia, on issues such as North Korea given recent developments, even though reality is often much more complex than it is presented (See: “The Myth of a Malaysia-North Korea Special Relationship”). Yet talk of a convergence of interests also obscures the reality that these threat perceptions are far from completely aligned on these issues, be it with regard to the magnitude of the threat in question or the proper mix of means necessary to deal with it. That explains why, for instance, Malaysia’s stance with respect to North Korea, while noticeably firmer in recent months, still falls short of the harsher approach that the Trump administration has tried to forge among Asian states (See: “Should North Korea Be Kicked Out of the ASEAN Regional Forum?”). That misalignment can be exacerbated further by misguided policies, with a case in point being the initial stage of the George W. Bush’s war on terrorism, where the war in Iraq diminished the already relatively low popularity ratings that the United States had in Malaysia and made cooperation more difficult for policymakers. As I have noted before, it is not difficult to find Malaysian policymakers both fretting about the complications that arose in that era and being worried that history could repeat itself if Washington gets embroiled in another Middle East quagmire. The third and final issue is getting the balance right on rights. Though Trump and Najib might well try to ignore the issue of rights altogether while focusing on narrow interests – the former has evinced little interest in the advancement of American ideals, and the latter would be glad to avoid further scrutiny on this score given the withering criticism already heard ahead of the visit – for the two sides not to deal with this openly would be a grave mistake. This is especially because of the inescapable reality that the majority of Malaysians, particularly the youth, voted against the current Najib government that the Trump administration has invited to the White House, an honor that was not given by the Obama administration (and one that was instantly criticized in media circles). Despite the false dichotomy often presented between not addressing rights at all and doing so in a heavy-handed way – as U.S. Vice President Al Gore notoriously did during his 1998 visit to Malaysia – there is in fact a whole spectrum of options that Washington has to deal with this, as the Obama administration had demonstrated in many cases. But simply leaving this to fester would not only be a lost opportunity to tackle criticism head on, but also potentially open the door to other actors in the within the U.S. foreign policymaking process exerting limits on the development of these relationships, thereby complicating ties between the various branches of government. And as tough as it might be for Washington to deal with this now, it could be even more difficult with Malaysian polls coming up in the next few months that, though they are still Najib’s to lose, could yet see either a contested outcome or even a historic transition. Of course, addressing these broader challenges will be much more difficult than simply seizing on immediate opportunities. But if the two countries are to seriously expand and deepen their comprehensive partnership, as U.S. Ambassador to Malaysia Kamala Lakhdhir said in her Independence Day message to Malaysians last month, they must confront hard realities rather than just engineering another soft landing. Prashanth Parameswaran is Associate Editor at The Diplomat magazine based in Washington, D.C., where he writes mostly on Southeast Asia, Asian security affairs and U.S. foreign policy in the Asia-Pacific. Follow him on Twitter @TheAsianist. Managing the US-Thailand Alliance in the Trump EraA China Submarine in Malaysia Amid Najib’s US Visit?Tillerson’s First ASEAN Voyage: What’s on the Agenda?What Will Donald Trump’s Asia Policy Look Like?Are Indonesia and Malaysia Ready to Stand up for China’s Muslims?